Don’t you just love when items you’ve been lusting after for months go on sale? I was elated to discover these Giuseppe Zanotti velvet oxfords got marked down – I’d been craving a pair for what seems like forever! They are classic black with just the right amount of gold, and who doesn’t love that? The gold cap-toe and hardware glam up this comfortable flat shoe – they may even be more comfortable than my Chanel flats (which is saying something). What’s great about them is that they’re actually amazingly versatile – I wore them all day at work, but then they easily transitioned for a party at Forty Five Ten on Wednesday evening! Comfortable, wearable and fashion forward – is there anything better? Snag them ON SALE here. I’ve got some exciting news for you Instagram-lovers! You can now shop the looks I post on my Instagram, before I’ve even posted about the outfit on the blog! All you have to do is sign in with Instagram here with LikeToKnow.it and confirm your email address once. After that, each time you like one of my Instagram outfits that has the #liketkit hashtag, you’ll receive links to what I’m wearing directly to your inbox so you can shop the look! Click here to get started. 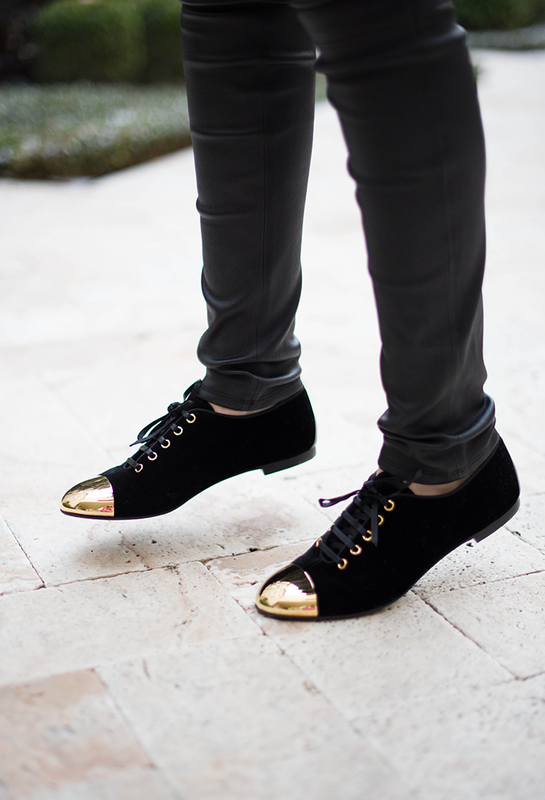 Love these oxfords, they are the cutest thing ever. We were on the same wavelength today with our post titles! 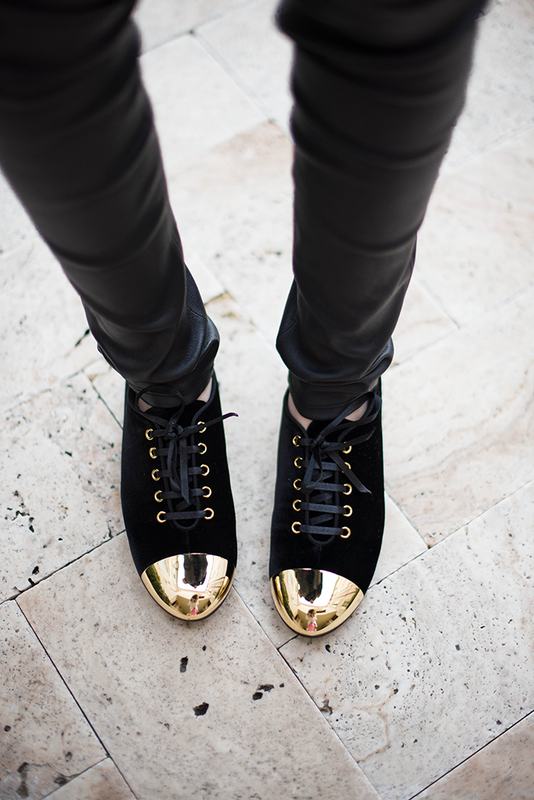 :) Love those shoes & the metallic detail…gorgeous jacket too! Someday I’m just going to show up in TX and raid your closet. This outfit is stunning. I love that blazer! That jacket is fantastic, love that shade of green woven in. Have a great weekend! I love when you find an extremely comfortable pair of flats! They really should be so comfortable but sometimes I honestly prefer heels over them! Love that green jacket too… amazing detail and a nice unexpected color! Seriously, I love those oxfords and they even look better when they are on sale! I also adore the jacket, it’s different. Your such a fashionista. I love a fabulous flat shoe that can glam up an outfit! Also loved your picks on Les Nouvelles today! absolutely loving this look – you are too cute! those leather pants and tweed blazer are incredible. Those shoes are amazing! I am madly in love. Have a great weekend! Those shoes. I die. The end. Great outfit! You just reminded me that I need to wear my leather pants!